Dogs by nature are exposed more intensely to environmental hazards. Being much closer to the ground, they encounter a wide variety of irritants as part of their daily lives. Environmental irritants can wreak havoc with your dog’s natural immunity. Exposure to lawn or pool chemicals, pollens, viruses and bacteria, or long-term use of medications can cause some dogs to suffer from itching, swelling, skin problems, and other minor illnesses. Dogs by nature are exposed more intensely to environmental hazards. Being much closer to the ground, they encounter a wide variety of irritants as part of their daily lives. Fortunately, there are a number of essential oils that have historically been used to bolster the immune system as well as support the lungs, liver and skin, and are safe for canine use. Many essential oils such as lemon, eucalyptus, tea tree, cinnamon, bay and thyme, could accomplish the task, but when striking the balance between powerful and gentle, three essential oils stand out from the bunch – niaouli, ravensare and frankincense. Niaouli (Melaleuca viridiflora) is an Australian tree that is related to the famed tea tree. Niaouli has similar properties to tea tree, but it has a more pleasant scent and is gentler to the skin and mucous membranes. Niaouli has been used in remedies for first aid, and to soothe skin disorders such as herpes, roundworm, sores and abscesses. It is helpful with viral, fungal and bacterial infections, including those that affect the ears and throat. As a natural antihistamine, it can help relieve allergic reactions, especially those affecting the skin and ears. Ravensare (Ravensara aromatica) is a tree that is related to the bay laurel and is native to Madagascar. It is a gentle yet powerful antiviral and antibacterial that can help support the immune system. It has been used in remedies to relieve flu, sore throat, bronchitis, fibromyalgia, mononucleosis, chronic fatigue and shingles. Some canine practitioners use ravensare to help dogs with compromised immune systems or until the vaccination schedule is complete. Frankincense (Boswellia carterii) has been an important commodity both socially and economically, used for thousands of years in incense, perfumes, and embalming agents, and more recently studied for its antitumoral activity. It is nontoxic and nonirritating to tissues, and because of its anti-inflammatory, antiseptic, antifungal and astringent properties, frankincense has been used in preparations for wounds, acne and boils, and to relieve dry, chapped or maturing skin. It can help support the lungs and immune system to relieve colds, flu, bronchitis and asthma. Frankincense has shown an ability to slow and deepen respiration, which allows feelings of calmness, comfort and serenity, and so simply inhaling the scent of frankincense can be soothing during unsettling times. The history of frankincense can be traced back more than 5,000 years, to rituals including the burning of aromatic roots, resins and woods for physical and spiritual healing. It was believed that the ritual smoke carried prayers to the gods and goddesses, who responded to them with healing. It is now understood that burning these plants actually releases essential oils that are antiseptic, immune boosting, and sometimes relaxing or mind-altering. Essential oils are the volatile oils produced within the seed, flower, leaf, bark, root or resin of aromatic plants for purposes of self-preservation. This includes attracting insects for pollination, repelling pests and resisting microorganisms that can destroy the plant. These complex chemical components within the plant can be extracted by steam distillation, cold-pressing, and carbon dioxide or solvent extraction. Scientific studies using aromatic plant substances were originally conducted and published in France and Germany. In the early 1900s, tests were performed on dogs and horses to determine how humans might respond to essential oils. These clinical studies used dogs and horses because of a physiological similarity to humans. The positive results collected from these studies led to the use of essential oils on humans, and by the mid-1900s, the practice of aromatherapy was not uncommon with French veterinarians. Clinical studies over many decades have shown essential oils to have a variety of medicinal properties including analgesic, antibacterial, antiviral, antifungal, antispasmodic, antiinflammatory, antiseptic, detoxifying, expectorant, immunostimulant, regenerative, and sedative actions. When used correctly, remedies containing pure essential oils can be a safe and effective natural alternative to conventional remedies. Because they are highly concentrated, it is advisable to dilute essential oils before use to avoid problems such as skin irritation or overwhelming the sense of smell. This is especially important with remedies for dogs, because they have a much stronger sense of smell than humans. Water-based mists work well with dogs, and can insure the essential oils are safely diluted. Mists are easy to use, and they won’t stain or harm materials or leave fur feeling sticky, even when directly applied. Combining niaouli, ravensare and frankincense in a water-based mist can help relieve the itching, swelling, skin problems, and other minor illnesses that can make your dog feel miserable following exposure to lawn or pool chemicals, environmental irritants, viruses, bacteria, or long-term use of medications. 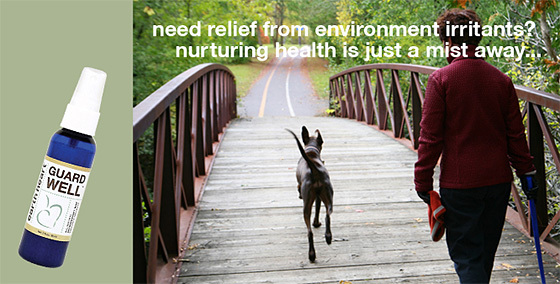 Your dog’s relief from environmental irritants could be just a mist away. GUARD WELL is an all-natural, safe and healthy mist specially formulated to help nurture a dog’s natural state of health. The mist, made with pure essential oils of niaouli, ravensara and frankincense, can be used on puppies from eight to ten weeks of age, and has been effective for over 95% of dogs who suffer from minor illnesses and health issues caused by exposure to their environment. Simply spray GUARD WELL on your hands to massage into the dog’s ears or abdomen, or lightly mist the dog’s favorite blanket or bedding. GUARD WELL was designed for Earth Heart Inc. by master herbalist and certified aromatherapist Vicki Rae Thorne. 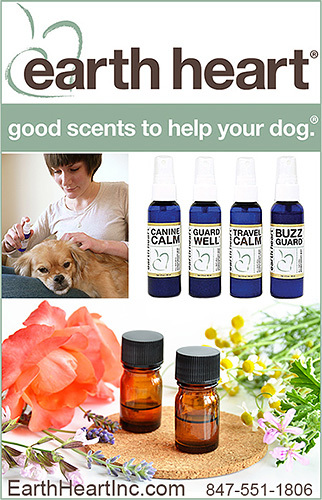 Earth Heart has a long-standing reputation for designing safe, affordable, and effective essential oil remedies that help dogs live happier, healthier lives. Family-friendly products are made in the USA, packaged in BPA-free recyclable containers, and are also used successfully with human and equine family members! Feedback from pet parents and professionals has shown that Earth Heart essential oil remedies are a safe and effective solution for fear and other stressors, travel sickness, skin and respiratory problems, insect bites, and how to create safer outdoor adventures without the use of harsh chemicals. Visit earthheartinc.com for more information.